Music is one of the best examples of Natural Laws at work, the seven principles of Mentalism, Correspondence, Vibration, Polarity, Rhythm, Causality and Gender. Music objectively, is the energetic vibrational charge of a local environment, producing a holistic tone which can be heard by the human ear. For example, the sound of a choir in a hall is a product of their individual voices blending within the geometry and material of the hall, to produce a tonal quality reflective of the sum of its parts. It is the flowering of all the qualities of experience developed within each object that contributes to the whole, including the life experience of the singers. Music subjectively, is the recognition of a marriage of flawless logic producing an emotional charge within, and is an example of the divine unity of mind, body and spirit. In this respect, the experience of listening to music penetrates the deep mysteries of being, producing a consciousness which is grounded in holistic thinking and transcends the limitations of egoic experience. Acoustic music, unlike digital music, has a harmonic quality which far surpasses the human ear, and literally organizes the material in our bodies; an entrainment phenomena. Consider Dr. Emoto's water and music experiments. 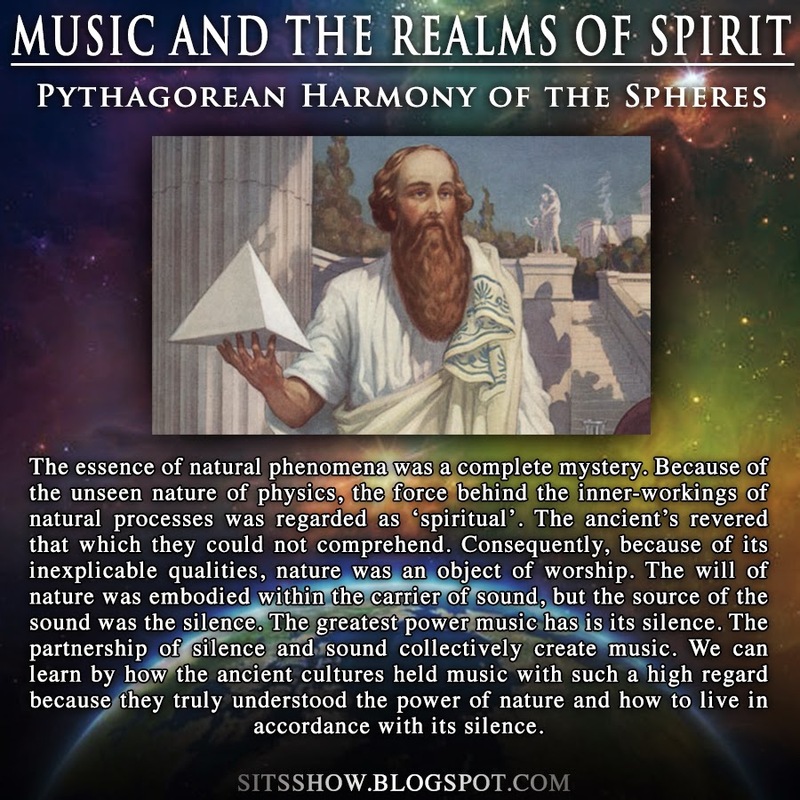 What I found very interesting about the Pythagorean philosophers is that music was widely regarded as a tool for divination, unlocking aspects of consciousness hidden away within. Divination is the process of learning about one's self, and the universe via a subjective process of knowledge generation. Listening to music allows the mind to expand the focus of attention on to a holistically organized system, which causes the unconscious knowledge hidden within to merge with the geometric observation of the sound, producing images, feelings and ideas. The more harmonically complex the music is, the greater its ability to activate consciousness, especially when combined with an expanding knowledge base as a result of truth seeking. 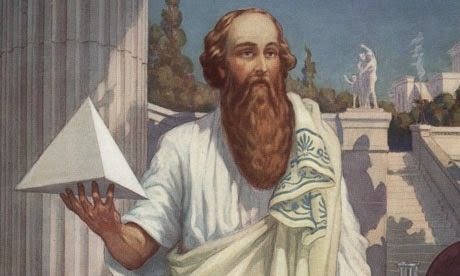 The first person in the western world accredited with the discovery of the harmonic series was a Greek mathematician from the 6th century B.C named Pythagoras, well known for the “Pythagorean Theorem”. Pythagoras considered the triangle to be the origin of everything on Earth. He established his famous theorem on this geometrical figure: “The square of the hypotenuse of a right-angled triangle is equal to the sum of the squares of the other two sides. He is lesser known for his discovery of how the harmonics interact with each other mathematically by dividing a vibrating string into several different harmonic divisions. The spaces between the harmonics represented the agreement between harmonics, called ‘harmony.’ The main Pythagorean belief was, “all of nature consists of harmony arising out of number”. The Pythagoreans were separated into two different camps because some were drawn to the math of sound, while others listened to the feelings that were produced by the harmonies in sound. They were called, Mathematekoi and Akousmatiks – listeners of acoustics and mathematicians of acoustic physics. Musical geometries affect us emotionally, but the nature of the spaces in between the notes of music is geometrical. The ancients were fascinated by the power of music to stir the spirit inside of their souls. Listening and wondering about the spaces between different tones stimulated the ancients to apply the harmonic ratios they discovered to the orbits of the planets. The emotional impact the harmony of sound was so great that man looked for a confirmation of the harmonic principles from the skies above. Because a reverence for sound provided the intellectual curiosity to apply harmonic ratios to the heavens – orbital ratios, the harmony of sound was the first cause that stimulated the ancient’s curiosity to apply what they had learned from sound to other natural phenomena. The ‘Harmony of The Spheres’ attributed conscious qualities to sound to the numbers, which also formed the harmonically derived basis for the study of numerology. I personally believe that these natural science evolved in this order; Harmonic ratios, numerology, and astrology. In the ancient times, Numerology and Mathematics were not separated, nor were Astrology and Astronomy because they were unified through the ‘spirited’ acoustic geometries of harmonic science. Pythagoras was so inspired by the spaces or ‘ratios’ between the harmonics that he applied their consonant agreement to the movement of the planets in our solar system. The first four harmonics that sounded symbolized the silent processes of the universe through the natural geometries of sound. In the Pythagorean school, even the roots of the words ,”Harmony” and “Arithmetic” had related meanings in Ancient Greece. “Arithmos” meant units and “Harmonia” meant unity. After studying the harmonic series, Pythagoras ascribed different personalities to the numbers which were borrowed from ‘harmony’. The same geometrical ratios were later applied to the orbits of the planets. Because of the separation that was historically made between science and consciousness, a modern day astronomer – astrophysicist may relate more to astronomy than music, but the roots of astronomy combined the acoustics of sound with the orbits of the planets, which the astronomer Kepler called, “The Music of The Spheres.” This is an ancient concept which exists both inside and outside of the parameters which have been established by the modern scientific community. The relationship between the planets and the harmonics ushered in a universal music which resonated throughout the universe in a silent and unseen geometrical balance. Ancient people regarded the power of sound as more than just a physical science, they consciously revered sound as the ‘voice of the heavens’. The heavens were found in the skies, beyond the visible plane of our perceptions. The ancients believed that the ‘heavens’ possessed a magical, mystical quality which transcended the laws of physical matter. The ‘music’ of the spheres refers to the spirit in matter. The spiritual aspect of musica universalis, and learning to listen to the spirit in sound, was as vital to spiritual concerns as the math which uncovers the shared geometries of the natural world. Ancient harmonic science was a spirit science, which attached spiritual significance to what the ancients perceived experientially, what they heard, saw, and felt, and how they interpreted it, was their religion. Their ‘religion’ was validated by everything around them that they saw and heard because their scientifically based study of harmony agreed with their perceptions. Then they visually applied the geometries of what they heard and felt to what they saw, and the symbolic language of music was born. The roots of symbolism were used as a tool for communication. The geometrical shapes musical frequencies produced were regarded as physically reflecting unseen and unheard processes. The ‘music’ in matter itself is seen rather than heard. The interplay of the sound and silence of music not only reflects the physical processes of the universe, but the ‘emotions’ it evokes naturally expresses the vibratory spirit of a fully conscious universe, which communicates more than any words can ever express because its expression stems from the very core of physical movement itself, ‘vibratory resonance’. The planets vibrate in harmony and nature’s music sings their songs of movement through the vibrations of sound, a celestial harmonic hierarchy, made up of the consciousness of the universe. The omnipresence of musical energy also inspired the ancient Greek philosophers to personify the physical nature of music through their Gods and Goddesses. Apollo was the God of music. The Goddesses of music were divided by the duality of concordance and discordance, or consonance and dissonance. The Goddess of consonance or pleasing music was called Harmonia or harmony and the Goddess of dissonance, or displeasing music, was called Eris. Let’s examine the Ancient root of the word “music” to further our understanding of what the true nature of music really is and why we like it and how we perceive it. The word music actually originates from the Latin word musica, which evolved from the Ancient Greek word “mousike.” Mousike is defined as “the art of the Muses.” In Greek Mythology the Muses were the Greek Goddesses of the Arts and Sciences. The Muse or, Goddess of Music, was a flautist named, “Euterpe”. Euterpe meant, giver of much pleasure. Music is composed of both sound and silence, they cannot be separated, one simply cannot exist without the other. The silent spaces between sound generate the geometries of music, so if one is concentrating on interconnection rather than divisions, it would stand to reason that the silent spaces between the planets would also conform to the musical geometries which act as a carrier of ‘spirit’. The music of nature’s processes started with the awareness of music itself. Music is the first cause which inspired the ancients to find correlations with the vibrations of music in other natural phenomena. The cycles of nature were most evident in the rising and setting of the sun and the moon. Time was measured through observing the natural cycles which revealed themselves in the skies. Although time measurement was more important than the study of music for practical concerns, the idea that the Sun and the moon were spirited, like music, also weighed heavily into the ancient perceptions of the natural world. Not unlike the heavenly bodies, music couldn’t exist without moving through time and space. Because of music’s natural relationship with the physical and the spiritual realm, to gain a full understanding of the spirited essence of Musica Universalis, we must first become both listeners, and later, if we care to take our level of understanding to a higher level, we must also become geometricians because the geometries and the moods produced by music are inescapably attached to one another. Before man gained the ability to create a noisy environment for himself, the only sounds that broke the peaceful state of silence were organically generated, particularly from the trees, the wind and the animal kingdom. This is precisely why natural events like thunder were likened to the ‘Gods’ because the power of nature to penetrate the drone of silence with a forceful noise signified sound’s status as an all powerful entity. Imagine what it may have been like in the days before any recordings when humans enjoyed a simpler, slower paced world of quietude. A continuous drone of outer silence pervaded human consciousness and music was regarded as a spirit which was recognized and embraced as a familiar friend and as a bonding force in human cultures. Music was not merely regarded as a form of entertainment, but it was revered as the sound of Earth’s own music. The ancients were much more concentrated on listening to their immediate surroundings, and because their very existence depended on their degree of attentiveness, they had to learn to cultivate their powers of listening to safeguard their survival. In all of the ancient cultures, the value of listening was of optimum importance because some sounds were non-threatening, while others could be potentially life threatening. Man had to learn to live in harmony with his environment to survive, but aside from the survival instinct, he considered himself as a participant in the world he experienced. He deified animals and even nature’s physical processes were deified as well. A reverent love was felt by humanity for nature and the natural cycles which enabled humankind to flourish on the planet. Silence and Sound were considered vital to humanity’s survival because the cycles of sound and silence were determined by Earth’s environment rather than the modern day cacophony of daily noise to which we have become accustomed. From afar, the breeze was gently broken by a sound which caught the ear and registered as something you recognized as beneficial or harmful to your mortality. But in spite of the intimate relationship man had with nature, The essence of natural phenomena was a complete mystery. Because of the unseen nature of physics, the force behind the inner-workings of natural processes was regarded as ‘spiritual’. The ancient’s revered that which they could not comprehend. Consequently, because of its inexplicable qualities, nature was an object of worship. The will of nature was embodied within the carrier of sound, but the source of the sound was the silence. The greatest power music has is its silence. The partnership of silence and sound collectively create music. We can learn by how the ancient cultures held music with such a high regard because they truly understood the power of nature and how to live in accordance with its silence. In a quiet environment we can focus our conscious attention to the stillness of the inner silence within us. We have heard the saying; “the silence is deafening”. We hear a chorus of faint, high pitched inner sounds ringing like a cosmic bell, a distant drone, an infinite sound with no beginning nor an end. We hear with our ears, but if we are in a silent place and there are no sound waves reaching our eardrums, the ‘loudness’ of utter silence must reside somewhere within our own psyches.The sounds we hear in our brain are inaudible, but we speak and listen to ourselves every day through thought. If it isn’t sound we are hearing, what are we ‘listening’ to? Sound and silence exist in a vibrational field of awareness that is the aether of the universe. The inner silence is not merely a void of nothingness where there are no thoughts, it is precisely the place in our psyche’s where the capacity of the human will and the potentiality of the imagination are assembled. Of course, the power of free will can be used to ignore or respond to the sound of the silence. We can suspend the power of the will by choosing to be afraid of placing our attention on our powers of awareness, or, we can willfully choose to embrace the silence within us which defines our quintessential nature as co-authors of an unseen creative intelligence, one which pervades the cosmic web of space and matter, through silence and sound. When we abandon the fear of the silence, our conscious awareness becomes a limitless playground to explore without any boundaries to obscure the inner sounds of silence from suddenly surfacing from out of nowhere, and then, immediately dissolving and bouncing off of a seemingly vacant background. These are the sounds of the resonant energy of consciousness, a reflection of the electro-magnetic vibrations which move through the vacuum of space, the same sounds that the planets make when electromagnetic energy is recorded and converted into sound waves. All of the vibrations of the universe are related through the partnership of sound and silence in ‘The Harmony of The Spheres’. If it was not for the galant support of readers, we could not devote so much energy into continuing this blog. We greatly appreciate any support you provide! UNITY of Non-Consent | Are You Ready To Be Free?